The return of the native - six years in. 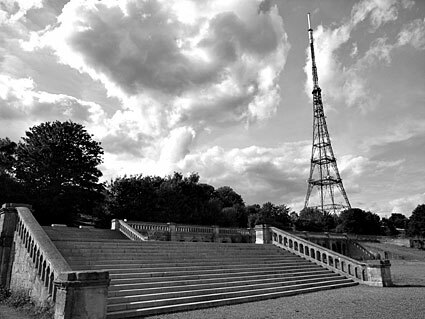 I have now been back in London for six years after an extended period abroad. It was a perverse time to leave in a way. A life - long socialist I fled soon after an apparently left wing government was elected. Perhaps I knew It’d be a very mixed blessing. 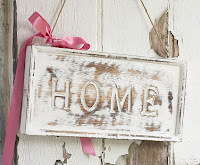 The longer I was away the less my home seemed to have to do with me. Going to war in Iraq, introducing fees for students, rendition, the hysterical reaction to Diana’s death and the advent of Big Brother just confused me. I began to feel like a refugee from Blair's Britain. When it was apparent my exile was not going to be permanent I worried about what I was coming back to. A few aspects of life in blighty upon reflection were very helpful in aiding what was a tricky but ultimately sucessful readjustment. 2) The internet. I was abroad for a long time and upon my return my old friends were pleased to see me but were wrapped up in domesticity, corporate warriordom or quite often both. At the same time life abroad is coloured by constant challenge, change and your average expat is unsettled, volatile and eccentric. 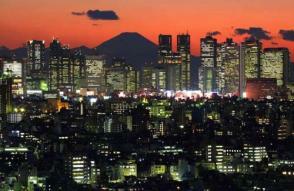 You are also thrown into social life, in London no one comes looking for your company. I sent a plea to a Scots dandy, he suggested the Chap magazine, old friends from the Goth scene were on-line. A presence on chat rooms meant I had acquaintances at least. Had the internet not become a phenomena in my absence my return could have been very cold. 3) The Sheridan Club and New Sheridan Club. I’m not saying I get on like a house on fire with everyone involved but I have never been bored and I am easily bored. The Chap magazine crowd and the later incarnations of the NSC have provided more interesting conversations, been more entertaining and the source of more good nights out than I could have imagined: these people are ace. Those people who rail on about 'elitism, conservatism and public schools twittery' do not actually know the people involved or are just inepts who have no sense of humour, irony or understanding. 4) Female company. I’m not a girly girl, I don’t want to fanny around prams or witter on about men, in fact traditionally I prefer male company but since returning to this country and partially via the bunch above I have met women who are lovely and I enjoy being with. Karen H, Sue G, Fleur, Mai, Maria, Lisa H, Naomi, Renee,the Helenas, Ali, Isobel, Bethan, Hannah and the massed Gemmas et al. I salute you. Heres to more cocktails. 5) The so called ‘vintage scene’ because I like hats, Northern Soul, carry on films, thirties frocks, rock n’roll, quiffs, rockabilly, cabaret, Glenn Miller, Lotte Lenya, Pathe films, red lipstick, Russian constructivism, naughty undies, posh cocktail bars, old Pullman carriages, art deco, seaside towns, Noel Coward and music hall. And I never need be alone. 6) Booze. It is better now than when I left. At that point pubs were not even becoming gastro pubs they were all themed. The wine tasted like pipe cleaning fluid and you still couldn’t have a quiet drink without being harassed. Cocktails were entirely the province of places like TGI Fridays and the beer was all Stella like lagers. Whilst I returned to binge drinking and shots and gastro pubs at least the latter had some decent plonk. More notably though was the return of the classy cocktail and the glamorous bar. 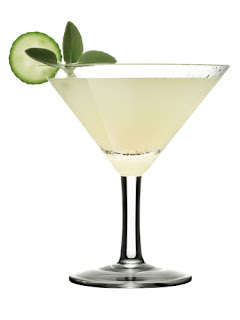 Having lived in a country where cocktails are ruinously expensive I could even bear the cost. 7) The bearded man, drives me crazy sometimes but one of the best things about life in London. A big thank you and a welcome! I'd like to say a big thank you! to anyone who has recently started following my blog and anyone who has continued to endure it, especially those who comment on posts. It amazes me constantly that anyone reads this regularly and I am appreciative. If you do meet me please say hello! Vintage Mafia Sale and Social: This Sunday! Just a reminder that this Sunday is the Vintage Mafia Social and Sale where some of us are selling lovely things that don’t fit us or we have duplicates of. This now includes some 'men’s bits 'courtesy of Ed and Sean. Stray boyfriends now have the option to drink beer and shop so there is every chance of persuading them to abandon footie, the pub (what do men do on a Sunday? I have no idea) to come with you. It is even featured in Time Out this week so come along early to grab some goodies! The general Spitalfields area is at its liveliest on a Sunday. Not many realise that this is a historic hang over from the area’s Jewish history when things closed on Saturdays. So Sunday is the day to visit the area and nose around Spitalfields market and Brick Lane but don’t spend any money there as we will definitely have the best value stuff. Even if you have just a little money (and we all know that feeling) pop along, have a look, come and say hello and treat yourself to a meal in a cup; otherwise known as a milkshake. One thing I am selling is a well fabricated reproduction classic fifties dress by TopRunway, made to measure for me just before I shrunk and too well tailored to be cheaply adjusted. In a medium weight aubergine cloth with white collar and cuffs it is a wonderful curvy size 12-14, absolutely pristine and a bargain at £30. 00 as I paid £53.00 and have never worn it (fuzzy image above). It will make you look like Kim Novak or any number of Hitchcock heroines. I’m going to have to order another one because I really like the design. Another thing that I have decided to sell is a gorgeous fifties red straw skull cap trimmed with gorgeous berries and leaves, beautiful but lost against my ginger locks. Needs a nice brunette barnet to rest on! Less frou frou vintage please!! 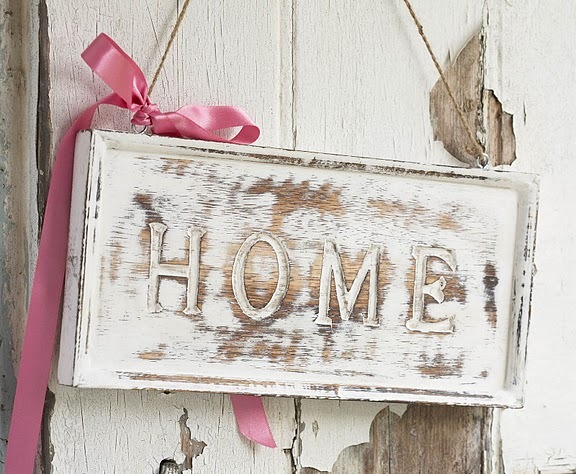 Vintage is now a word that most accurately seems to mean distressed faux farmhouse furniture in white or pale blue. It means mimsy floral chintz, especially in waxed form, or miss matched china tea cups and saucers as long as they have designs including more blooms or polkadots. It is overblown cupcakes in any form, little bits and bobs of buttons and cheap mass produced knick knacks sewn on to everything. 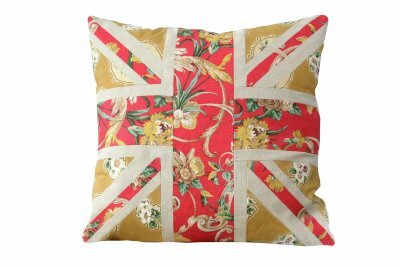 It is needlepoint cushions featuring union jacks and pugs, it is old jugs filled with expensive pink roses and green hydrangeas, it is reproduction biscuit tins and little wire things to hold eggs. 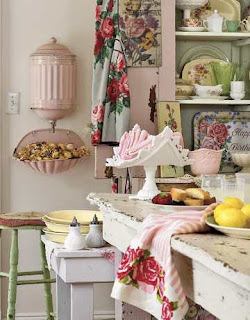 It is sugary, it is cluttered, it is utterly girly and in great amounts it makes me want to throw up (over a cane chair reupholstered in Cath Kidston fabric with gingham ribbons tied on the the corners). Don’t get me wrong, I like porcelain teacups, polka dots and rickety old junk shop furniture, I like most of the stuff above in moderation: I just cannot bear the twee overwhelmingly fussed with sheer tweeness of the whole idea. It isn’t that I dislike excess, in the Victorian menagerie, baroque lunacy or Gothic Count gone made style I love it. Not a purist and I dislike minimalism yet there is something about all this vintage frillery frippery that grates, possibly it is boredom. And make no mistake, to the media and mass culture as a whole that is what we are talking about when we use the word 'vintage'. At Vintage at Southbank last weekend I picked up a free copy of BBC Homes and Antiques Vintage issue and it was full of this notting hilly yummy mummy stuff. I learned‘Vintage’ is ideally accessorised by two sweet little children, Milly and Oscar, tricked out in dove egg blue corduroy and peter pan collars. Oh and a dog, probably a Shitzhu type thing with an old fashioned working class name like Bert or Sid. I can see the magazine does have its fantasy appeal and the ladies on their stall were very nice., nothing against the magazine per se, it is catering for an audience. They were wise enough to have the lovely and very knowledgeable Naomi of Vintage Secret advising and had an article on wonderful Stein jewellery. Their introduction to what vintage was however a big fib, actually car enthusiasts and antiques buyers are right, if you call something less than 50 years old vintage you are big fat pants on fire liar. Just because today's PR's and clueless fashion magazines and a load of 20 somethings have suddenly decided that they think 70's or 80's is vintage doesn't make it so, imagine if I tried that with anything else. I'd end up in court for misrepresentation. 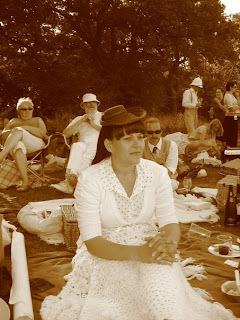 Vintage 'style', if you say so, retro certainly but it ain't vintage under 50 years unless it is wine. Unless that is 'vintage' has become something else, in which case what term do we use? 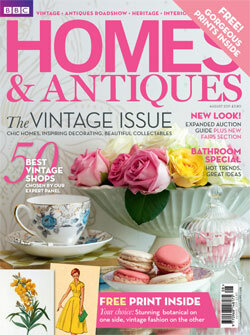 40's clothes are not antiques a nd I'm unilaterally (well no one else listens to me!) reclaiming the word vintage for what it actually means genuinely old. Not something that anyone over the age of twelve has already worn before. I suppose I am frustrated that an interest in past eras has congealed into this. I shouldn’t be surprised as I am getting serious de ja vu. It is the mid-seventies all over again. 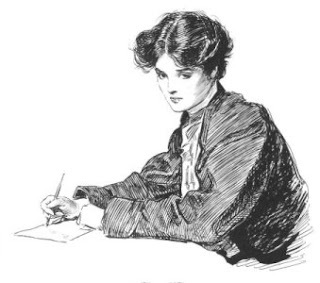 Then the country obsessed over Victoriana, Laura Ashley made a killing, the Timotei and flake girls ruled adland and the whole country went nuts for Diary of an Edwardian Lady. Everyone either had a lace petticoat sticking out from under their skirt, a folk art inspired dirndl or a Little House on the Prairie style triangle fabric tied around their head.s It was a look inflicted on me as a child. The 80’s were always better than the 70’s, they at least paraphrased the forties and pirates. It is not that I dislike flowery things or girlishness I am, as I said, just bored of it. Cupcakes are not the only cake. I suppose what is irritating me is the sheer sticky vanillaish conservatism lying behind it all. Is it down to the recession? It is certainly recessive. It gives the feminist in me the heebeegeebees. I’m finding the overwhelming nostalgia irksome, I just like the look of things from the past and one reason is that the clothes often reflect, for me at least, fast changing, challenging worlds but it is not an aspirational thing. I like being in a fast moving, liberal, all sexual orientations all lifestyles modern kind of world. There is a sharp cold wind of conservatism out there and conservatism tends to be selfish and oppressive. 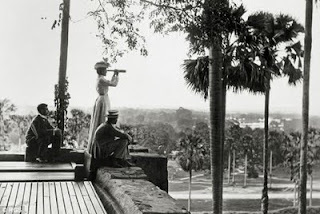 The past got a lot of things right but I wouldn't want to live there! Maybe I read too much into it but cozying up the 30’s and 40’s and 50’s and presenting them as a soft focus version of the past seems retrograde in the wrong way. I'm all for escapism but is there much difference between wrapping women up ‘vintage’ style and sticking us in short lycra mini skirts and painting us wag orange. It’s also yet again ageist, this style of vintage only suits the very young or the fecund, if you were middle aged you would be described as mutton dressed as lamb double quick. I do like pastel colours, I do like flowers, blimey I even like little gloves and macaroons but with added sharp conversation, some gin, some sharp deco glass and a soupcon of sassiness. I admire Greta Garbo, Lauren Bacall, Chanel, Ida Lupino, Amelia Earheart and Lee Miller. I never remember seeing a picture of them in a pinny. I cannot think of a flowery dotty flowery cupcakey style icon as a comparison. If someone truly loves dressing like this I am not criticising them, I am worried by the motivations of the media in promoting just one entirely domestic, ultra-feminine housebound version of a passion with the past. I think this is one of the reasons many assume that an interest in historic style equals right-wing conservatism, a rejection of modernism, reactionary beliefs and the evasion of real life through nostalgia. 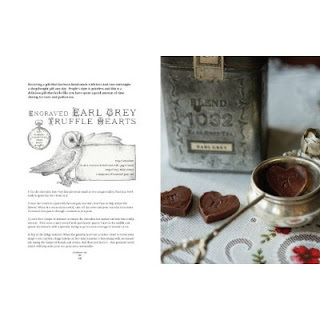 It might be expected that a book about holding a vintage tea party would be a) obsessed with mimsy little cakes b) full of sugary illustrations involving roses and doilies and c) unbearably twee. Angel Adoree’s new book ‘The Vintage Tea Party’ is none of these. It is however a very pretty book, but with more of an Alice in Wonderland aesthetic emphasised by scratchy elegant linear illustrations with more than a smidgen of the surreal. Foxes, magpies and owls roam around the pages and this, along with the re-occurring icon of a fob watch gives the book a slight steampunky feel. Yes there are the totems of modern vintage a plenty here but the effect is more charming whimsy than saccharine tweeness. So what we have here is the modern take on vintage but with a well shod kick to it. This is perhaps because the author is not really so much jumping on a bandwagon as riding up front on a circus train. Some of you may recall her appearance on Dragon’s Den, she has subsequently set up a successful business; the‘Vintage Patisserie’, no mean feat in the current economic climate. I have tasted some of her wares which were delicious. This is not a dilettante but someone who makes her living out of the business of vintage themed events. Cookery books these days seem to either be selling the personality of the author or a lifestyle. To some degree this tome does both. I was charmed by the pictures of the author’s family in East London and her very personal description of her (non standard) route into the world of catering. Some might find this approach a bit too individual but I appreciated it feeling that it made the reader feel like they were sharing someones enthusiasms. This was further exemplified by the long list of thank you’s at the end of the book. In as far as it is selling a ‘lifestyle’ the whole vintage thing is very popular at the moment but the author seems to be encouraging a home-made approach rather than the wholesale aspirational commercially acquisitive tack taken by other food writers. 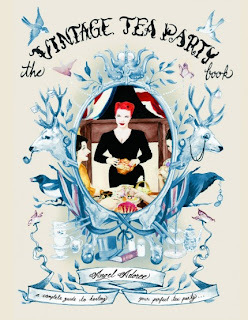 The book includes a stencil (of a young queen Liz) and invitation designs that can be copied plus lots of advice but none that requires an expensive trip to John Lewis’ kitchen shop for 'essentials'. 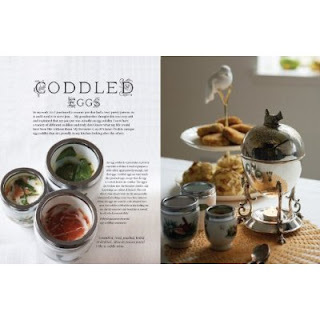 The book's pages on coddled eggs. Although the book is lifestyle orientated and contains lots of general ‘vintage’ advice ultimately it is a cook book and this is the nitty gritty and the real context in which it should be judged. My initial opinion is that many of the recipes appear to be simple, do not require great amounts of expensive ingredients and look delicious, it is well illustrated with good photographs. 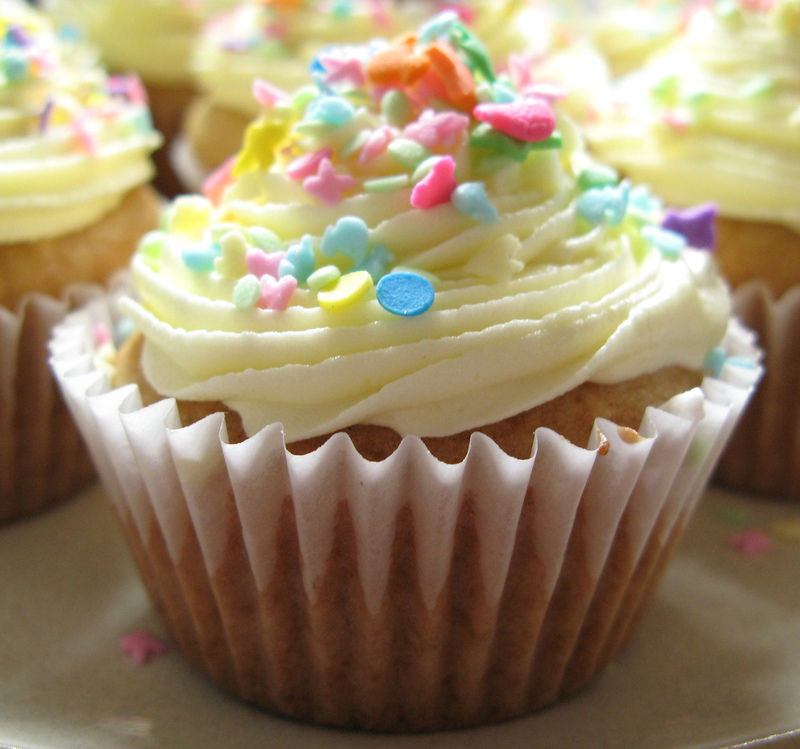 I am not a beginner when it comes to baking but I think a beginner could manage many of the dishes. At the same time there are some unusual rmore demanding dishes and some highly imaginative ones, I was particularly taken by the recipes for beetroot and artichoke maracas and black coffee canes which I'd like to have a go at. I would like to recommend to some of my gothier friends the recipe for a 'salad cemetery'. There are also a number of recipes for forgotten foods, one of these, and an old favourite of mine is coddled eggs. These are basically eggs poached in little steamers and then tipped out so they resemble small pert eggy puddings. Anything can be added to flavour them, they are a cheap delicious nursery snack. The author could start demanding royalties from Royal Worcester if sales of china egg coddlers take off! My own tip for these is to line the coddler with buttered toast and add some cheese and bacon! The book takes a holistic approach and includes recipes for smoothies and alcoholic beverages whilst the photographs provide ideas for attractive presentation. I feel that this is a good useful cook book wrapped in a confection of 'vintage' but that vintage here could be as much addressed to the past generally. It reminded me of the recent spate of television programmes reminding us of the wit and imagination applied to celebratory food of the past. It will suit the new fan of ‘vintage’ but there is a lot to please the gothically inclined and those who simply want to escape from the ubiquitous cup cake and produce sweets and savouries with a little more oomph, taste and creativity. One of the reasons why, I think the whole interest in the past has mushroomed recently. If we have to put up with riots, tedious politicians and corporate dullness in much of modern life why not make a teatini or some Hibiscus champagne? I enjoyed the books determined Englishness and rather breathless quality. Most particularly though I think I would enjoy the food. This book would make a lovely gift, and one that will help an independent small business to thrive. It is a pleasant change to see a cook book that is not produced on the back of massive restaurant chains, or television series or supermarket tie-ins. Having said that, I suspect Angel’s particular brand of vintage catering might make quite good telly, not least because like all the best ladies she has vivid red hair! 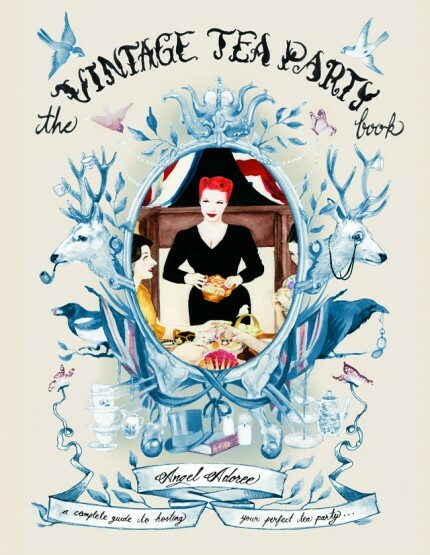 The Vintage Tea Party Book is available from Amazon. Vintage at Southbank...another impression of the day. I spent most of the weekend before last at Vintage at Southbank. Now I need to get one thing clear, I had a ball. 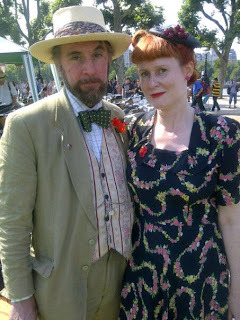 This was because I was involved in the Chap Olympiad. This was with a group of the most committed yet most un-up themselves retro types you can find. The event even in truncated form is entertaining and the ‘great British public’ turned out to be great sports and the sun shone on us. In return for rolling up and making fools of ourselves for several hours and being photographed into oblivion we had free passes and some free refreshments. So for me it was basically a week with people I like and respect, helping others have fun. Win win really although quite exhausting, time had to be taken out of the day job the following Monday to recover. The festival itself was an odd beast. 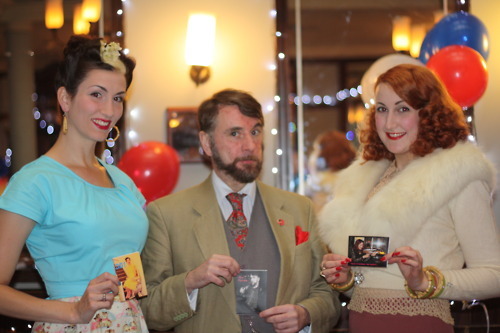 The bulk of the vintage shopping available was outside as was the High Street which seems to be one of the distinctive features of this particular event. 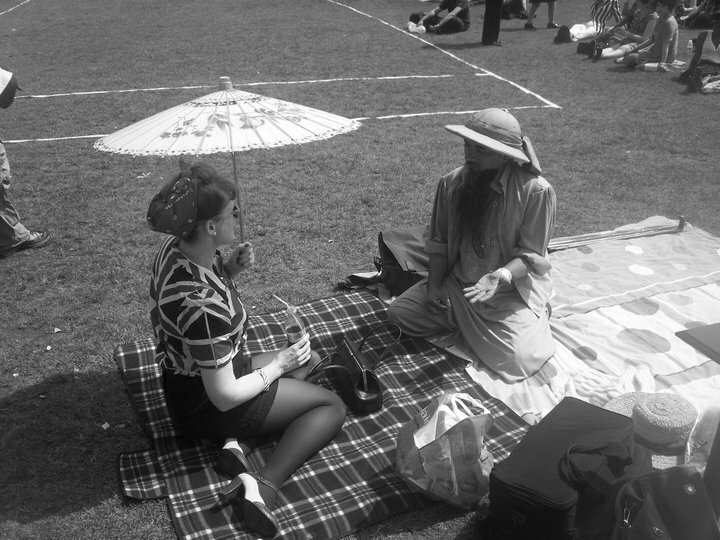 And both were free, as was the Chap Olympiad although sadly the organisational side of things was a bit of a mess, we were not signposted and helpers at the Hall didn’t know who we were despite the fact that the Olympiad was all over the printed publicity. I could not help feeling that the complaints of those who paid £60.00 per day for access to the Festival were understandable. Inside the Festival Hall the music/performance side of things appeared to be DJ top heavy and there were fewer live acts than I might have expected, especially as entry to the main Revues incurred extra charges on top of the entry cost. There was also no effective air conditioning so it was very, very hot. I have heard however that the Festival organisers might not be responsible as the Hall has been having problems with this in recent weeks. Sadly dancing in the Let it Rock and Black Cotton Club areas was near impossible as a result which was a shame. I am also, and this is me personally, ambivalent about crafting and painting workshop type events. 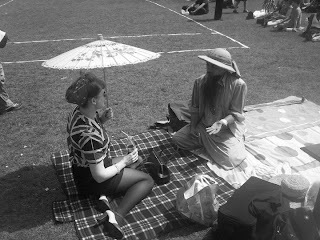 I find them a bit ‘middle class person at a boutique festival’. 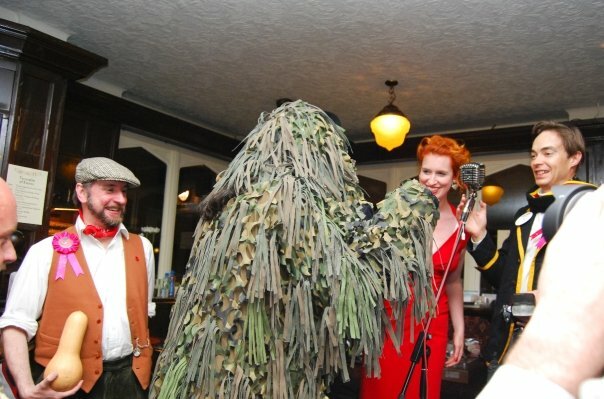 I don’t want to trim a hat or make a skirt when I am skittling around with my chums drinking beer and looking for music. That’s not to say that fashion shouldn’t take a centre stage and in fact this is where I think the Hemingway’s are really on to something. I think more fashion, maybe millinery and make up demonstrations; talks and lectures would have been great. I felt these would be more effective than having girls queue up for ages to have a makeover. Perhaps rows of mirrors and hairspray and Kirby grips could be provided for them to play with. I would have liked far more fashion shows; in fact a day of them would have kept me happy. Although I am biased I really wish that last year’s Chap fashion show had been repeated as I was sad to miss it at Goodwood and I feel that self-styling is at the heart of British fashion. Featuring some of the major repro brands and perhaps a ‘sub-cults’ of Britain show would have been entertaining as would more menswear. Unsurprisingly I loved the British Airways fashion show which I really enjoyed and which the organisers did a good job of sourcing. I liked the Style Lounge on the upper floor balcony which was some kind of discofied thing, not my cup of tea but the music suited the space and it looked like the people up there were really enjoying it. It was startling to see so many people dressed up and often dressed well, especially those who probably don’t do so regularly: all those young girls ditching asymmetrical bagginess in favour of a pretty dress and a flower in the hair was a refreshing sight. I didn’t make it into the Warehouse Hacienda style basement as I just didn’t fancy that on a hot summer day in a hot building and being an 80’s girl I felt no need to revisit. Dancing the hokey pokey with hordes of jivers later in the day was however hilarious and the John Miller Orchestra who were headlining kept us happily there until late on Sunday night. As a local girl I also bitterly regret missing the opportunity to dance the Lambeth Walk around the Festival Hall! The atmosphere, especially when the place thinned out in the evening reminded you of what an involved friendly and interesting crowd of people the Hemingway’s were (partially) catering for. 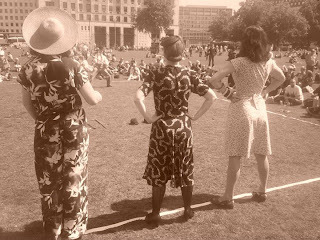 Bethan, myself and Fleur squaring up to Mr Wax..
Perhaps the festival was really intended to be a mass market taster for the general public tapping into the current craze for all things vintage rather than an event for the aficionado. Most big successful festivals do not start this way, they cater for a core group, and when they start doing that really well they naturally expand, and naturally make money. It was an ambitious and no doubt costly event to put on, a first in that venue and held at time when we are watching our purse strings. Many festivals catering to the retro crowd are big but they are also very good value, having said that if a festival is good it is a crowd that will spend large amounts of money. I know people need to make money but the truism is these things work best when they are born out of enthusiasm, for music, era and the community attached to it and sometimes I got the feeling there was not enough love there. Actually that’s not entirely fair there were obviously lots of people involved who were very committed to its success. 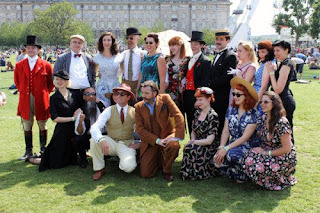 Certainly although we were there as Chap Olympiad peeps, we worked hard (particularly Bethan) to make this a good spectacle for anyone who turned up to watch/participate. Similarly I saw lots of people I know happily explaining their clothing to visitors, smiling at tourists and having their photographs taken with children; this is not a cliquey elitist bunch of people. I would have liked to have said hello to Mr Hemingway himself but I didn’t see him (although I get the feeling he is probably growing sick of seeing us). It must appear that people are possessive and critical of an ‘outsider’ barging into ‘their’ scene but I don’t feel that is really the case. When things go wrong it is easy to be smug when my attitude is that I want to see people do well. I have also always respected people who do things rather than sitting around talking about them. The organisers should get some grass roots people from the various scenes together to see what did work and what might work better rather than relying on people supposedly higher up the food chain. I do think there is a market for a festival inspired by the past which includes cultural, style and fashion elements in addition to those already out there. Disorganisation, rude minions and the odd useless PR person can be set against the most cheerful jive and lindy instructors in town, Viv the Spiv exhorting observers to get dancing and those house fans going nuts on the balcony. Were you there, what did you think? Pillage my Wardrobe!!! August 21st: bargains galore! Roll up, roll up! 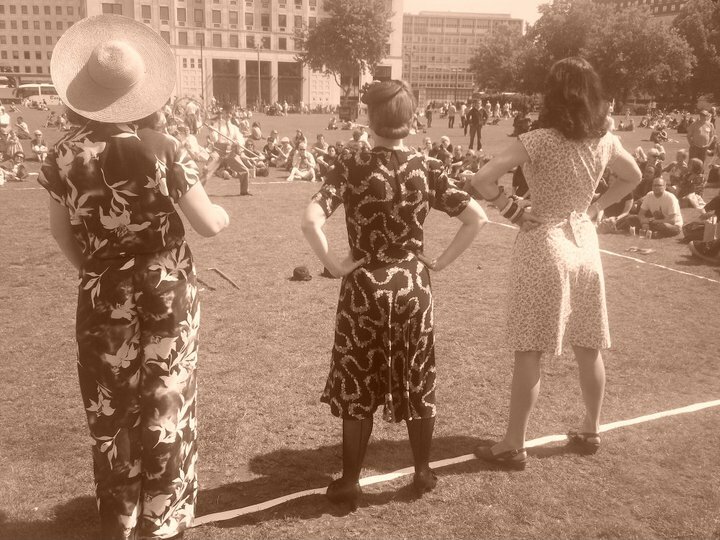 On August 21st the Vintage Mafia are having another one of their small but perfectly formed Vintage Sales and Socials at the LoveShake in Shoreditch. East London…I know! 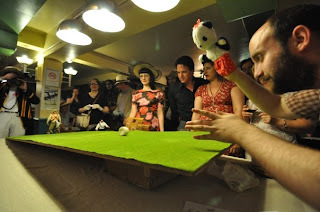 But it is a very short walk from both Old Street and Liverpool Street stations and the venue is a charming homage to a fifties shake bar, why not combine a trip to this with a trawl around Spitalfields, a short walk away and liveliest on a Sunday. The word ‘social’ is in the name of this event as you can also grab a drink, a shake or a burger whilst you rummage through the rails or just sit down and chat. 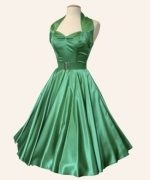 Beautiful Emerald Vivien of Holloway circle dress. The clothes are in the sale due to overfull wardrobes, duplicate clothing and size fluctuations. There is no 80’s tat, moth eaten pieces on their last sad legs and they are clean and in good condition. 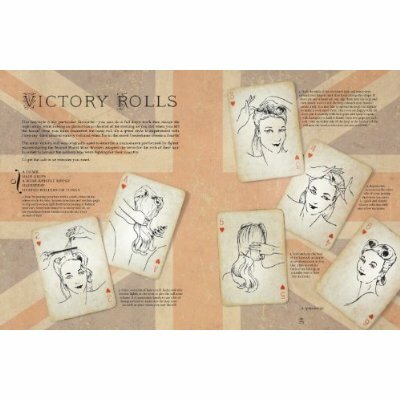 Apart from frocks there are accessories and other small items and these range from vintage to repro to high street reflecting the past. Finally, and importantly for us all, the prices are very reasonable and unlike on-line goods you can try them on before you purchase. Tara Starlet pink home front dress size 14, hardly worn. It is here that I declare an interest as I have been kindly allowed to sell some of my things at this fair. In my case I am clearing the decks due to things not fitting (as some of you know I have been ill). I’ll have a good sprinkling of large size 12’s, 14’s and even the odd size 16. There will be (real) vintage, repro and up-market High Street all laundered and in good or honestly described condition. Amongst these is a fantastic late 50’s wiggle dress in burgundy with a gold thread, a sweetheart neckline and a cinched waist which I really wish I could shrink, its a large 14 small 16. I also have a fantastic pair of Japanese geta style sandals with Japanese silk thongs but a wedge heel with bright stripes. I bought these from a shop in central Japan and they would set off a fifties beach outfit brilliantly. 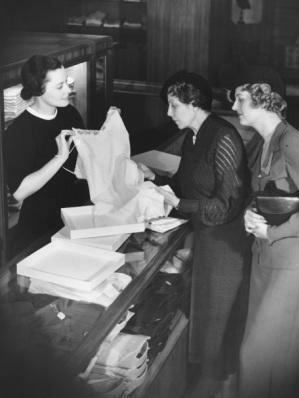 Also on the rails will be an emerald satin Vivien of Holloway circle dress with bolero in a 14 and two Big Barbara Brown repro dresses in size 12 and size 14 including the lovely 30’s style spotted Evita dress. Tara Starlet Peggy, fantastic speckled bengaline fifties shape, size 14. Additionally I have two Whistles 40’s style tea dresses (generous size 12’s) and two Tara Starlet dresses: the Homefront tea dress with flowers (14) and the Peggy (also 14) which have hardly been worn. 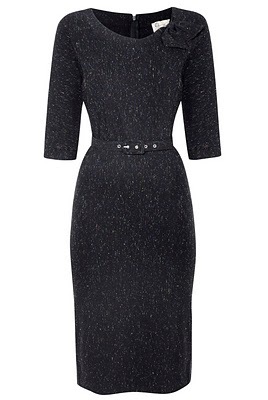 I also have pure silk evening dresses from Jigsaw (contemporary) and Coast (30's style). All of these dresses cost £70.00 - 120.00 for bog standard High Street prices. I may also, if I have the time beforehand be selling some original art work and cards. I'm not a seller really and I don't do ebay as I cannot get to a post office without getting up early on a Saturday morning; so please catch the train /boat/camel East and pillage my wardrobe, I want to see my frocks go to good homes! Any questions pop me a comment or email me. Tashes picni..err I mean cricket match..
After Vintage at Southbank on Saturday we took a ‘breather’ at the delightful art deco Knight’s Bar above Simpson’s on the Strand. We were sitting there minding our own business drinking our cocktails when in breezed Librarian around town and NSC fixer Artemis Scarheart. In full white tie he was heading off the Candlelight club. 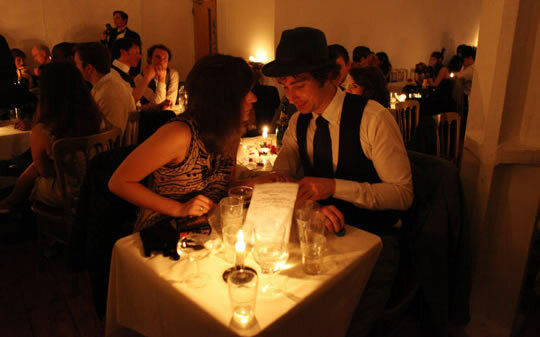 Entirely lit by candlelight this event has really taken off but unlike many so-called speakeasy events it does not, despite an expansion in numbers, seem to have attracted that dodgy crowd that turn up at other prohibition-inspired events. 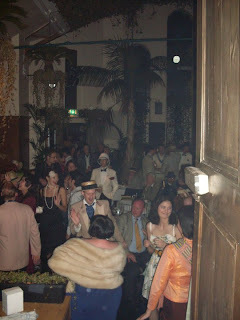 Not necessarily a typical retro crowd they do dress up, are very friendly and dance uninhibitedly. In August on the 20th they are having a Ball in an as yet secret location although they say it is somewhere special, I can really recommend this well run event with delicious cocktails, further details here. 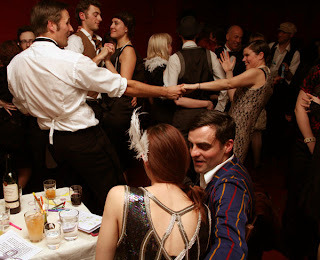 Dancing at the Candlelight Club. The Vintage Mafia are holding the second of their sales on Sunday 21st August at the Love Shake Here you can find well cared for clothes at decent prices and honestly sold. Last time I picked up a lovely thirties style Karen Millen dress and a hand- made felt brooch which has earned me lots of positive comments. 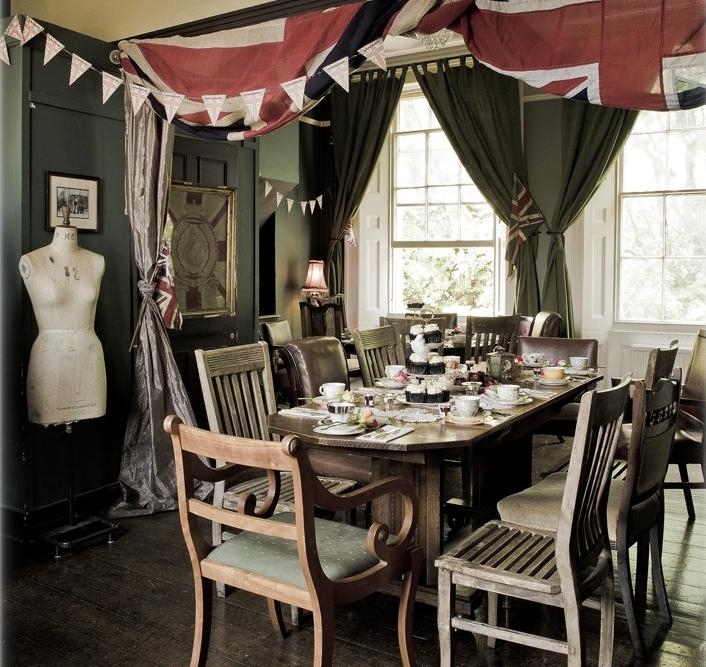 Pop in to Johnny Vercoutre’s Time for Tea for a quick cuppa beforehand, there are diner style drinks and food at the sale and then you can wander off to examine you buys at the pub afterwards. Perfect way to spend a Sunday afternoon. Details here. Stylish Clothes from stylish ladies. 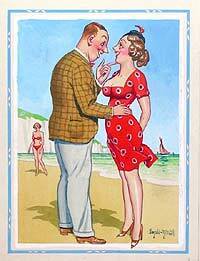 Seaside frolics at the Kiss Me Quick party. The high point of the month is for me the New Sheridan Club's Kiss me Quick! summer party on the 27th of August. These events are closer to the Chap Olympiad in spirit than anything else. They only happen twice a year and are organised for love rather than profit and are inclusive not cliquey. This summer’s theme is seaside/maritime and it will include some form of entertainment not to mention the famed silly games. They also provide an excuse to either wear your finest finery or take the more, ahem, dramatic route. My challenge this year is to choose between sailorette or pirate: now that is what I call a quandary. This year’s event will take place in the Tea House Theatre in Vauxhall, very close to tube, train, bus connections and MI6 headquarters. Further information: here. 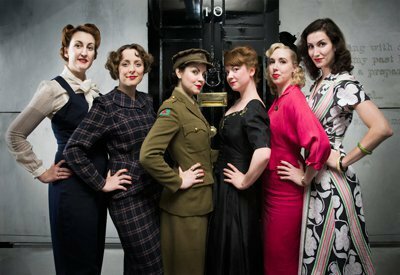 A heads - up for early September , on Saturday the 10th those lovely ladies ‘The Vintage Mafia’ are hosting their initial evening social event: ‘The Ric Rac Club’. Details are sketchy at the moment but I anticipate it will involve good music and some of London’s more stylish night owls. Bearing in mind the general ebullience of the hostesses themselves it is also very likely to be a lot of fun as they don’t take themselves too seriously. 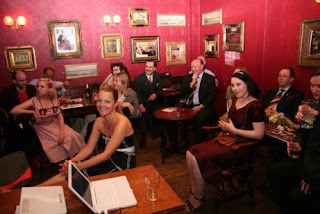 I also anticipate booze, well the venue is the Fox which is a characterful old pub close to Old Street Tube. 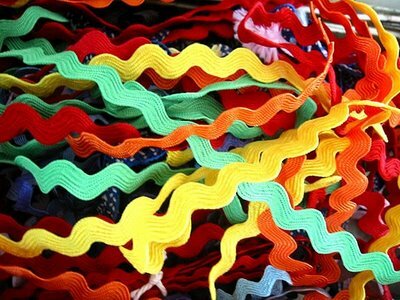 Oh and by the way for those who may be wondering, ric rac is a kind of trimming made of curvy woven cotton, not a medieval torture gizmo! Details of the night can be found here.